The Knoll list price on this is $781. 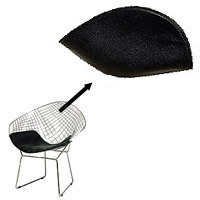 Replacement back pads for our version of the Bertoia Diamond wire chair. Available in 100% Genuine Italian Leather or the economical faux-leather option. The leather pads are fabricated using 100% Italian leather, processed in Italy, by Mastrotto Group. This top grain leather is aniline dyed and turned in drums to soften it. Then, a finish coat is added to protect the hide against stains and fading. Our top grain leather has a fine and supple hand. We feel that it is an excellent combination of softness, durability, consistency of color, resistance to sunlight, and ease of maintenance. Not only is leather soft and luxurious, it can outlast fabric up to four times longer. This leather is also known as semi-aniline or aniline plus. Comes complete with 2 front and 2 rear adjustible velcro ties.